Mar Sako makes a pastoral visit to the diocese of Alqosh, on the northern end of the plain. His Beatitude meets with the local clergy, presides at a Eucharistic procession and discusses the situation in the Chaldean villages. He notes the "sufferings" and calls for "cooperation , participation and concrete measures" to boost the presence of the local Church . 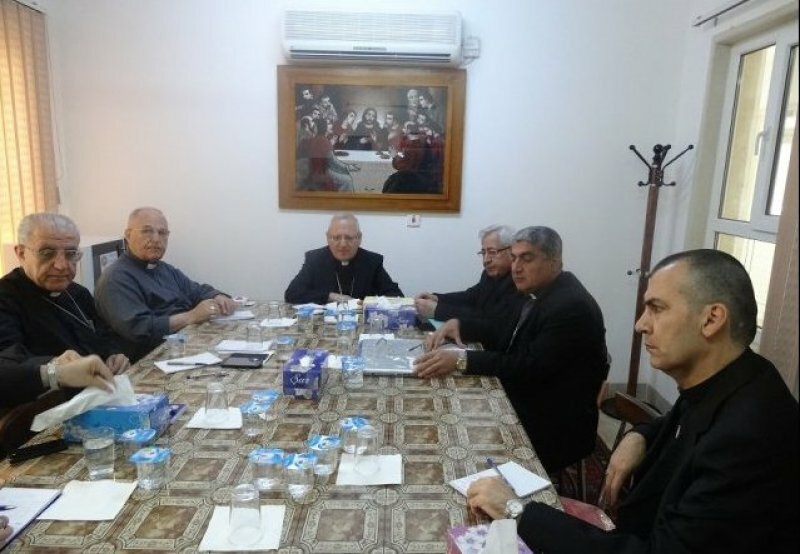 Baghdad ( AsiaNews) - Chaldean Patriarch Mar Louis Raphael Sako I has described a recent pastoral visit to diocese of Alqosh as an "excellent opportunity" To "see directly on your suffering and your expectations", because he "felt deeply what you feel. The Diocese of Alqosh deserves more." This was underlined in a pastoral letter that the leader of the Chaldean Church sent to the diocese following his visit to the north and AsiaNews, following his visit from May 9 to 16 last. Mar Sako, was joined on his visit of the diocese by the Auxiliary Bishop of Baghdad, Msgr. Shlemon Warduni, the Archbishop of Kirkuk, Msgr. Yousif Thomas, and the Archbishop of Basra Al- Habib Hormuz Nofaly. Mar Sako recalled the glorious past of the region and expressed his hopes that even today it can "play the same ecclesiastical role of service with greater competence". Alqosh is a city in the north of the country (not far from the border with Turkey and Syria), in Iraqi Kurdistan, in the governorate of Nineveh; according to a plan promoted abroad, but opposed by the Chaldean Patriarch since his time as Archbishop of Kirkuk, there was an attempt to create a Christian enclave in the area to protect the minority from conflict and violence. It is located about 50 km north of Mosul, a stronghold of the Sunni Wahhabi fundamentalism, where attacks and explosions are a frequent reality. In contrast Alqosh ( "The God of Justice" , ed), is an ancient city dating back to the seventh century BC, and is one of the main centers of Assyrian- Chaldean Christianity. A little more than 3 km distant, on the slopes of the mountain, there is the famous monastery of Rabban Hormizd , home of the Nestorian patriarchs from 1551 to 1804 and , in the nineteenth century, the main monastery of the Chaldean Church. The delegation was welcomed by the local bishop, Mgr . Mikhail Al- Makdesi , accompanied by priests, sisters, deacons and faithful. In the course of the pastoral visit Mar Sako presided at a Eucharistic procession and attended a meeting of the Chaldean clergy, highlighting the objectives of solidarity, unity and renewal of the Christian community. His Beatitude also discussed the situation of the Chaldean villages on the Nineveh plain, Zakho , Dohuk and Amadiyah , paying particular attention to the problem of migration, its causes and factors that can counter it. In the pastoral letter the Patriarch calls on his "brothers and sisters" to "keep your authentic Eastern Christian identity and heritage, deepen it with authenticity, and renew it with honestly in order for it not to stagnate and dry. And hold to your beautiful language, culture and your Christian values whatever difficulties and challenges" The Church is a "community" of people, he adds, and if it is not safeguarded, it is in danger of "being impoverished". This demands an "effective participation" in a context of "unity and cooperation that is a sign of hope for many". Mar Sako also points out that he had asked the bishops, nuns and monks to "take care " of vocations to the priesthood or consecrated life as "a sign of the Churches' vitality" and the need to "appoint a priest to every village" currently without a pastoral leader. Faced with a Christian community that has almost halved since the U.S. invasion of 2003 and those who are pushing for the creation of an enclave in Nineveh, His Beatitude encouraged marriages and openness to children , because "children are a blessing and the best guarantee of a the future". Mar Sako also spoke of his meetings with top officials of the region - the mayor of the province of Nineveh, president of the Provincial Council and representative of the Kurdish region - and his request for measures to raise people from the conditions of poverty and exclusion. He now expects "concrete actions " including employment opportunities and housing, especially for young people; but he also called on the community to show the solidarity and traditional "welcome" that has distinguished it down through the centuries. "For our part- concluded Mar Sako - we have moral and historical responsibility towards the villages of this Region, we will follow it closely and with concern because of the significant impact on the survival of our children and their continuity not immigration. The well-being of our Church and our people are foremost in their homeland".